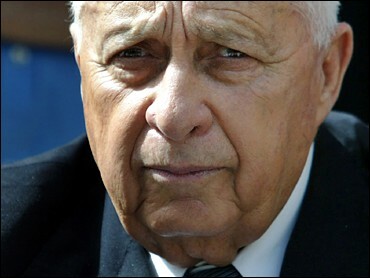 Prime Minister Ariel Sharon tried to push forward his Gaza withdrawal plan during a tense seven-hour meeting of his divided Cabinet on Sunday, threatening to fire recalcitrant ministers and reshuffle his government if he fails to obtain a majority. The meeting ended without a vote, but with growing uncertainty over the fate of Sharon's government. Some Cabinet ministers tried to find a compromise that would rescue the U.S.-endorsed plan and mend ties between Sharon and his main political rival, Finance Minister Benjamin Netanyahu. The plan — or a compromise — might come up for a vote at next Sunday's Cabinet meeting, but even that is not certain, said Justice Minister Yosef Lapid. "In any case, there is not at the moment a clear picture of where the things are going," Lapid, head of the moderate Shinui Party, told Associated Press Television News. Sharon wants to withdraw Israeli soldiers and settlers from all of the Gaza Strip and evacuate four West Bank settlements. His hard-line Likud Party rejected the proposal in a May 2 referendum, enabling some ministers — who had reluctantly supported the plan — to shift sides. In a rare interview with an Israeli TV station, Palestinian leader Yasser Arafat gave conditional support to the Gaza pullout plan. "When will it come? Will it be a complete withdrawal?" he asked. Arafat also offered to meet Sharon and talk peace. "Why not? If there is a will for peace, it will overcome all other ideas," he said. Israel is boycotting the veteran Palestinian leader, charging that he is implicated in Palestinian violence. Sharon told ministers Sunday that he is determined to get his plan approved even if he has to "change the makeup of the government or take unprecedented political steps," one participant said on condition of anonymity. Israeli media said two ministers from the hard-line National Union party could be the first to go, which would give Sharon the majority he needs. Currently, 12 ministers oppose the withdrawal and 11 are in favor. Effie Eitam, head of the pro-settler National Religious Party, accused Sharon of attempting to form an "artificial majority" and said his party would quit if Sharon fired ministers. Without the two parties, Sharon's coalition would no longer have a majority in the 120-member parliament. A shakeup could open the door to a coalition with the moderate opposition Labor Party, but could also trigger a rebellion against Sharon in Likud, already in turmoil over the Gaza plan. Lapid, who supports a withdrawal, proposed holding a vote only on a small portion of the withdrawal plan, in hopes of securing a Cabinet majority. However, Israeli media reported that the Bush administration is urging Sharon to stick to the full plan. Israel's ambassador in Washington, Daniel Ayalon, said Sunday that Sharon is determined to go ahead with the plan. "There is absolutely no pressure from the United States whatsoever," Ayalon said. Sharon and some of the ministers argued Sunday over whether the United States would back a watered-down proposal, officials present at the session said. Reflecting concern about a U.S. reaction, Sharon's top aide, Dov Weisglass, was to head to Washington later Sunday, an official in the prime minister's office said. In the Gaza Strip, some 7,500 Jewish settlers live among 1.3 million Palestinians, controlling one-third of the crowded coastal territory. Sharon has said withdrawing from Gaza would boost Israel's security and help it hold on to chunks of the West Bank in a final peace deal — a position Mr. Bush has supported. The proposed withdrawal has heightened tensions between Sharon and Netanyahu, a former prime minister who is popular with Likud's rank and file and seen as a Sharon successor. At the Cabinet meeting, Sharon appeared to take jabs at his longtime rival. "I want to warn those friends among us who are trying to exploit this moment of crisis in order to advance a personal plan," Sharon was quoted as saying. In Gaza, meanwhile, Wael Nassar, 38, a top Hamas commander, was killed early Sunday in an Israeli airstrike, along with his assistant, Mohammed Sarsour, 31, and a bystander. The two Hamas leaders were on a motorcycle at the time of the strike, witnesses said. Hamas called the attack a "cowardly crime of assassination." The Israeli military said the Hamas commanders were responsible for several attacks against Israelis, including suicide bombings, and were planning further attacks. Thousands of Palestinians attended funerals for the Hamas militants Sunday, calling for revenge. In the West Bank, Israelis arrested the chief administrator of Ramallah's religious court, Hamas activist Ahmed Mubarak, and two other people, Palestinian officials said. The court handles matters such as marriages, divorces and wills. Security sources confirmed the arrest, calling Mubarak a "Hamas terrorist."